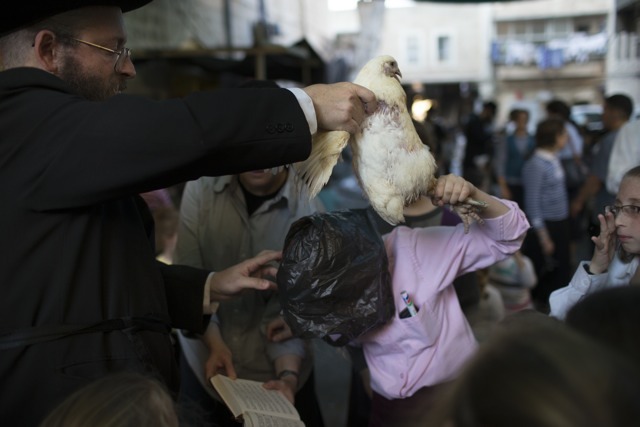 Leading up to Yom Kippur, some ultra-Orthodox Jewish communities follow the tradition of "kaparos/kaparot," which is the ritual killing of chickens. And in Los Angeles, it&apos;s been an event attracting both Orthodox Jews and protesters. Now, the California Department of Food and Agriculture has shut down two kaparot groups. CDFA investigator Rhett Dunn told the LA Times, "I told [Bait Aaron, a Sephardic Orthodox outreach organization, and Ohel Moshe, a synagogue,] what they&apos;re doing is against state law. They have to be properly registered." Both groups had been conducting kaparot on Pico Boulevard. Protesters contend the chickens are being treated inhumanely. One told the paper that he got involved when he saw this five years ago, "I&apos;ve been to Vietnam, I worked in packinghouses, but this was particularly shocking. I told them, and I remember what I said, &apos;You&apos;ve got to stop this. This is wrong,&apos; They laughed at me." Also, while some kaparot-observing groups claim that they donate the chickens to charity, last year the Jewish Journal reported, "On or around Yom Kippur of 2012, department trucks picked up a recorded 19,685 pounds of dead chickens from &apos;two pickup locations in the Pico-Robertson area and one in the La Brea-Melrose area.&apos;"
Dunn said both groups cooperated, "I provided them with information so that if they want to do it next year they can go through channels."